Abundant resources and well-developed infrastructure. Major clusters to create regional industrial hubs. JSW Group to establish a jetty at Ramayapatnam Port. 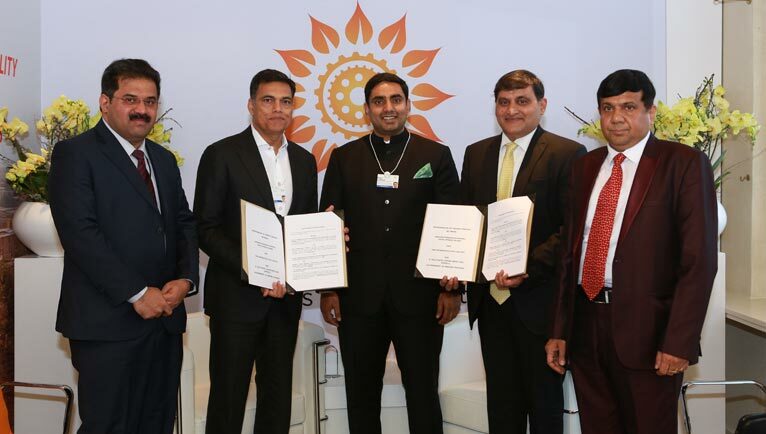 JSW Group signs MoU with APEDB at WEF, Davos. The board acts as a catalyst to facilitate economic growth, investment climate, reforms, and competitiveness in Andhra Pradesh. This is what the World Economic Forum has to say about Andhra Pradesh. What are your thoughts? 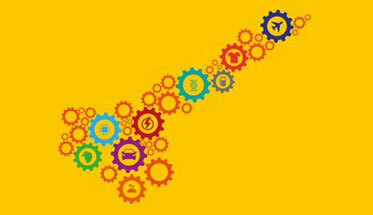 Visit our Facebook & Twitter pages, to join the conversation to know more about Andhra Pradesh's super growth story. Hon'ble Chief Minister N Chadrababu Naidu delivering his keynote address at Future Decoded, an event organised by Microsoft at Mumbai. 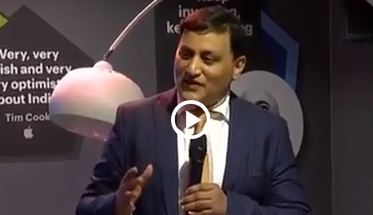 He says "Andhra Pradesh to lead the way for digital transformation in India"
Mr. J.Krishna Kishore, CEO, Andhra Pradesh Economic Development Board explains (APEDB) the USP of Sunrise state of Andhra Pradesh at Make in India summit at Bern, Switzerland during delegation visit from APEDB to induce investors from Switzerland to invest in Andhra Pradesh’s growing economy. On the sidelines of World Economic Forum, the Andhra Pradesh Economic Development Board CEO Mr J. Krishna Kishore delivered welcome remarks at the AndhraPradesh and Japan dinner which will further strengthen the relationships of the two countries. APatDavos hosted the dinner at the India Lounge in Davos. 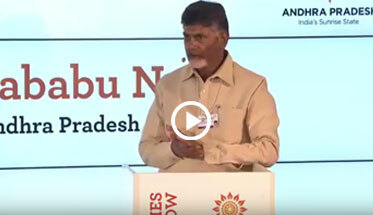 The Andhra Pradesh CM Nara Chandrababu Naidu delivered his keynote address at "Technologies for Tomorrow" interactive luncheon a gathering with top innovators at World Economic Forum. Followed by a Panel Discussion on "Technology & Sustained Economic Progress", with Closing Remarks by Mike Schwartz, Partner & Managing Director. 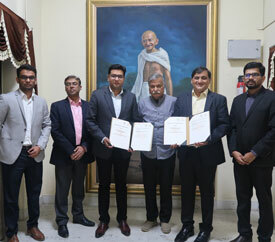 Asia Pulp & Paper (APP) signed a Memorandum of Understanding (MoU) with Andhra Pradesh Economic Development Board (APEDB), to develop a greenfield pulp and paper plant in Prakasam district. with a capacity of 5 million tonnes per annum. 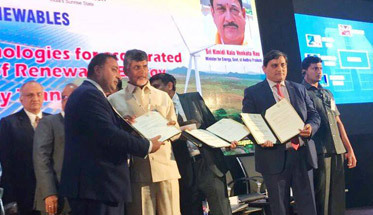 The MoU was signed by J. Krishna Kishore, Chief Executive Officer, APEDB and Suresh Kilam, Executive Director, Asia Pulp & Paper, in the presence of N. Chandrababu Naidu, Honourable Chief Minister of Andhra Pradesh. 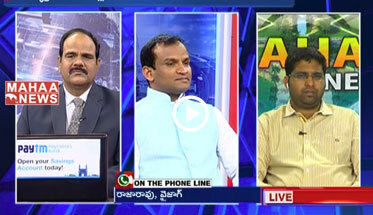 APEDB, CEO, J Krishna Kishore spoke to ETV, “Under the leadership of our visionary Chief Minister, Sri N. Chandrababu Naidu, Andhra Pradesh is on its way to become a Global Logistics and Transhipment Hub”. The second edition of Smart Logistics Summit & Awards Amaravati 2018 organised by Maritime Gateway magazine in partnership with Andhra Pradesh Economic Development Board and Andhra Pradesh State Warehousing Corporation December 21, 2018 at Hotel Novotel in Vijayawada. 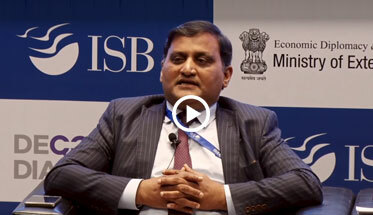 Andhra Pradesh Economic Development Board CEO, J Krishna Kishore from the Deccan Dialogue conference on economic diplomacy for development, at ISB (Indian School of Business) in Hyderabad. 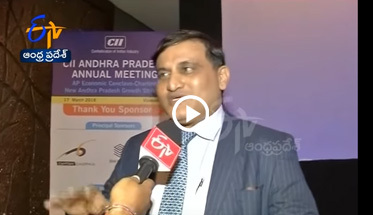 APEDB, CEO, J Krishna Kishore speaks to ETV, about the recent collaborations formed by Andhra Pradesh Economic Development Board, at the CII Partnership Summit 2018. Sounding very positive on this front, he was confident about the prospects ahead. 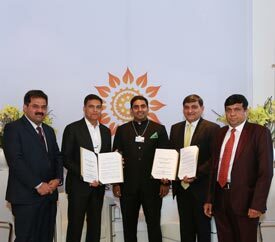 The Andhra Pradesh Economic Development Board, CEO, Shri J. Krishna Kishore, had signed an MOU with Mr Samba Bathily, CEO, Solektra Int for the establishment of a Solar Academy and Solar Assembly Plant in Andhra Pradesh. The Akon Lighting Africa is an initiative started by Solektra International to bring clean, renewable and affordable energy solutions primarily to rural and off-grid areas in Africa. The Co-founders of Solektra International, Mr Samba Bathily and Celebrity singer AKON were present during the signing of the MOU. 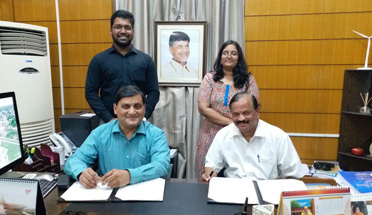 Raghava Logistics signed a MoU with Andhra Pradesh Economic Development Board to set up an integrated Ware housing and Logistics Project in Andhra Pradesh. 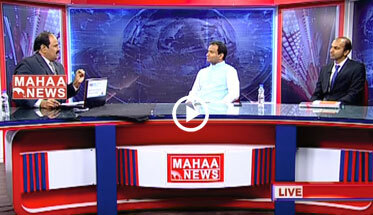 Andhra Pradesh Economic Development Board in discussions with Mahaa News, talking about the NRI investors and their investments involved in developing India. 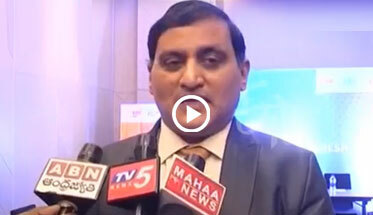 Andhra Pradesh Economic Development Board speaks with NRI investors through Mahaa News. 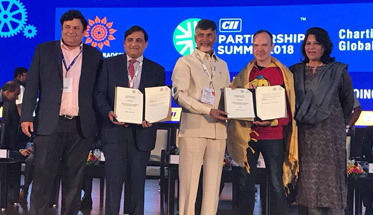 3F Advanced Systems has signed an MoU with Andhra Pradesh Economic Development Board at the CII Partnership Summit 2018 looking to invest a sum of Rs 550 Crores to establish an "Integrated Manufacturing Hub for Detection and Protection systems in the State of Andhra Pradesh". 3FAS wishes to bring direct investment to the State of AndhraPradesh. This agreement, facilitated by Krishna Kishore Jasthi, CEO, APEDB & headed by the Andhra Pradesh CM Nara Chandrababu Naidu, has a potential to generate 850 direct jobs and many more in auxiliary industries. 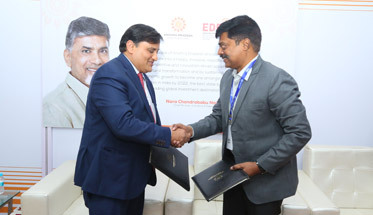 Andhra Pradesh Economic Development Board and Essen Electronics Pvt Ltd. have mutually signed an MoU at the CII Partnership Summit 2018, by which Essen Electronics Pvt Ltd. wishes to invest in manufacturing Defence / Aerospace Systems and engage as a system supplier for indigenously developed torpedoes and underwater mines, in the State of Andhra Pradesh. VEM Technologies Pvt. 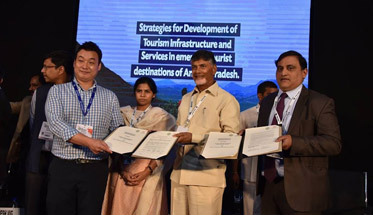 Ltd. has signed an MoU with Andhra Pradesh Economic Development Board, in the presence of the Andhra Pradesh CM Nara Chandrababu Naidu and Amarnath Reddy N, Minister for Dept. of Industries, Govt. 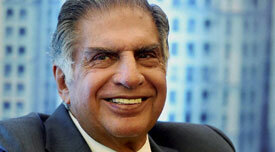 of Andhra Pradesh, to bring in an investment of approx. Rs 550 Cr for setting up of Manufacturing facilities for Naval Systems (“Naval Systems Project”) and is expected to create direct employment opportunities to 600. 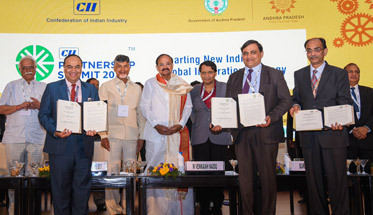 The Andhra Pradesh Economic Development Board has hosted an event at the CII Partnership Summit 2018 in the august presence of the Honorable Andhra Pradesh CM Shri Nara Chandrababu Naidu, where the Government of Andhra Pradesh, represented by the Director of Ports and All cargo Logistics Limited signed an MoU for setting up an Integrated Logistics Park in Andhra Pradesh. The State of Andhra Pradesh and FINEST are signing this MoU covering robotics, education and mobility solutions, ushering in a powerful partnership between AndhraPradesh and Finland. 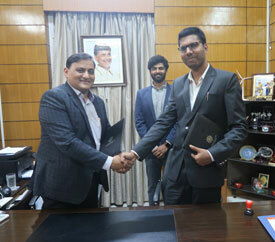 The MoU covers: (i) building a robotics and AI focused University that will partner with the Pori Artificial Intelligence and Robotics Campus and other Finnish and Estonian educational institutions (ii) Facilitate the development of robotics and AI based startups and companies around the campus and the collaboration between Andhra Pradesh and Finnish companies, (iii) Replicate the Finnish startup ecosystem experience in the Innovation Valley in Andhra Pradesh, (iiii) The University will include a unit for upgrading and enhancing the level of primary and secondary education across all Government schools in Andhra Pradesh, (v) Facilitate the creation of mobility as a service solution for the happy cities being planned in Andhra Pradesh, and (vi) Partner with APEDB for the development of the gaming industry. The Andhra Pradesh Economic Development Board, under the Chairmanship of Honorable Andhra Pradesh CM Nara Chandrababu Naidu, has signed a joint MoU with Society of Indian Automobile Manufacturers, and Automotive Components Manufacturers Association of India in order to boost up the manufacturing of automobile and auto components in Andhra Pradesh. This move, initiated with the support of Mr. Suresh Prabhu, Hon'ble Ministry of Commerce and Industry, Government of India, would help in forming Sunrise AP into a leading investment destination. CAMCO Construction signed an MoU with Andhra Pradesh Economic Development Board at the CII Partnership Summit 2018 for setting up a 3-star hotel at Anantapur district. The summit, with over 2500 delegates aims to invite major investors across the globe to help achieve Sunrise AP. 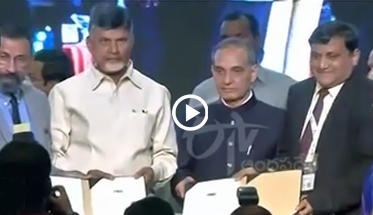 APEDB, under the dynamic leadership of the Honorable Andhra Pradesh CM, Shri. Nara Chandrababu Naidu is keen on collaborating with more number of companies in making the state prosperous by generating employment. We, at APEDB, look forward to welcoming more number of key players at the 3-day Partnership Summit 2018. 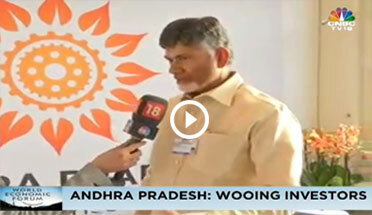 The Andhra Pradesh Chief Minister, Nara Chandrababu Naidu speaks to NDTV of India’s prospects and highlights, before the country session at Davos. 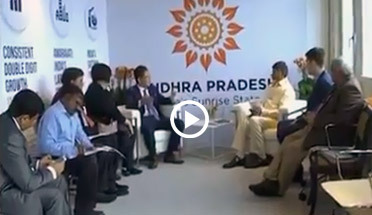 During a meeting with Kinya Seto, CEO, LIXIL Group on the fourth day of the World Economic Forum in #Davo the Andhra Pradesh CM said, “We want to build Amaravati into a hub for construction materials" speaking on his vision for Amaravati. The Lixil officials told the Chief Minster that they possess advanced aqua ceramic technology for manufacturing. CEO, Kinya Seto informed the Chief Minister that they are planning to invest Rs.1500 crores in three phases in India and are looking for skilled labor. He also informed the Chief Minister that they can start the production by the end of the year. The Chief Minister assured all possible cooperation from state government and said that the Andhra Pradesh State Skills Development Corporation - Apssdc will help them in training the manpower. Earlier today Professor Dr. Tobias Dauth from Fraunhofer IMW, a technology research organization met with Andhra Pradesh CM Nara Chandrababu Naidu. 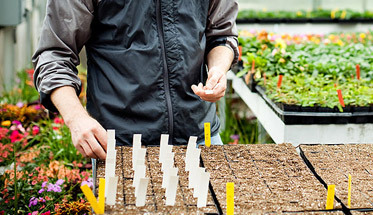 The organization is located in Leipzig with an employee base of 20,000 people. BMW and Bosch Global both Fraunhofer's clients are exploring possibilities in India and similarly they can enable several companies to Andhra Pradesh & the Chief Minister committed to his support. Andhra Pradesh CM Nara Chandrababu Naidu talks to Shereen Bhan about his plans to woo investors to the state & the use of technology. 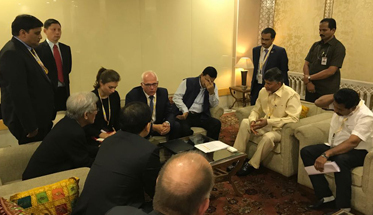 At the World Economic Forum 2018, on Day II the Andhra Pradesh CM Nara Chandrababu Naidu met with Said Hadrami VP International Operations of Saudi Aramco a leading oil exploration company. This was a follow up meeting where the Chief Minister assured the VP on fast tracking progress in further expanding on-going projects in India beyond their Asia operations in New Delhi to a possible refinery project in Krishnapatnam. Andhra Pradesh Economic Development Board is thrilled to be associated with supporting Aramco's downstream ventures in Andhra Pradesh. It was an excellent day for the Andhra Pradesh Economic Development Board as we signed a landmark three Way MoU. Andhra Pradesh Government, UNESCO MGIEP & Ministry of HRD to join forces for a unique gaming hub, supporting Nara Chandrababu Naidu's vision of transforming Vishakhapatnam into a Tech-enabled Education Center. Refer to the news video link for reference in detail. Andhra Pradesh Economic Development board (APEDB) was there at the Excon 2017, Bengaluru; the largest Construction Equipment Exhibition in South Asia. The aim of our participation was showcasing, Andhra Pradesh's pioneering initiatives to promote, building and construction material investments, into the state. 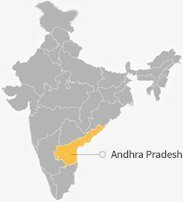 Currently Andhra Pradesh has 14 Smart Cities, a high-speed rail from Visakhapatnam to Chennai, Sea Ports, a Greenfield international Aerotropolis center, and major solar parks. 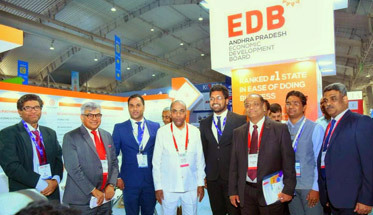 Team APEDB met with industry leaders and garnered support from Mr. Anant G Geete, Union Minister for Heavy Industry & Public enterprises during the event. Andhra Pradesh Economic Development Board was present at the business seminar held in partnership with Kia Motors Worldwide hosted in Seoul; Hon’ble Chief Minister of Andhra Pradesh Nara Chandrababu Naidu delivered the keynote address, speaking on Andhra Pradesh’s potential and offerings. Here is an excerpt of his speech. 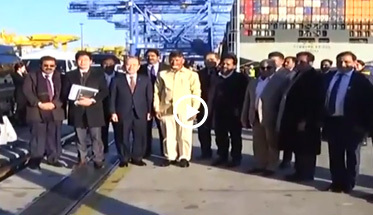 On Day II thanks to Mr. Kang Buwon, VP Busan Port Authority, Hon’ble Chief Minister of Andhra Pradesh Nara Chandrababu Naidu toured the largest port in Busan, South Korea. The Port of Busan is a Metropolitan City that includes four modern ports, international passenger & 6 container terminals Busan, South Korea. Pusan New Port owns and operates container terminals at the Pusan port. The major industries in the Port of Busan include shipbuilding, electronics, steel, automobiles, ceramics, paper and chemicals. On Day 1 in Seoul our Hon’ble Chief Minister of Andhra Pradesh Nara Chandrababu Naidu along with Vikram Doraiswami, Ambassador of India to Republic of Korea met with 16 Korean associates & vendors of KIA Motors to gain deeper understanding of their concept, investment, & employment generation intent in our state of Andhra Pradesh. Representatives from Andhra Pradesh Industrial Infrastructure Corporation and Andhra Pradesh Economic Development Board were present. Keep tracking the CM's trip here with us at the APEDB. The Hon’ble Chief Minister of Andhra Pradesh Nara Chandrababu Naidu along with high level ministers from GoAP including APEDB CEO Mr. J. Krishna Kishore met with Hwang Kag-Gyu, President & CEO of LOTTE Corporation Ltd, a conglomerate Head Quartered in South Korea. Mr. Naidu elaborated on Andhra Pradesh's food processing units, mega food parks and proximity to ports for import of specific raw materials making it conducive for LOTTE and similar players to invest in the state. It was further decided that a joint working group will be set up to support Lotte with Indian Ambassador to Korea Mr. Vikram Doraiswami leading the efforts. Here's a video message from Mr. S.P. Tucker, Former Chief Secretary to Government of Andhra Pradesh and Executive Vice Chairman of Andhra Pradesh Economic Development Board urging participants at the ITServe Alliance Synergy 2017 Conference in Houston to work as partners of Andhra Pradesh Economic Development Board enabling an evolved IT & ITES ecosystem in AndhraPradesh. Mr. Prasad Garapati, the Chairman for our IT Taskforce Committee is at the ITServe Alliance Synergy 2017 Conference in Houston, Texas today representing the Government of Andhra Pradesh. The Andhra Pradesh Economic Development Board is delighted to collaborate with ITServe to drive the growth story of IT and ITES in the State of Andhra Pradesh. 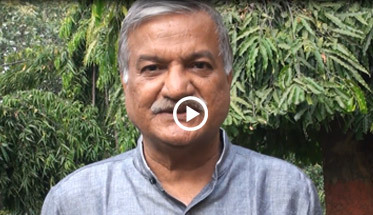 Here is a video message from Mr. J. Krishna Kishore, CEO @Andhra Pradesh Economic Development Board; to the participants at the event. 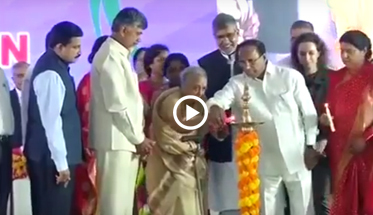 Our Chief Minister Nara Chandrababu Naidu supports women’s empowerment. Launching the ‘Amaravati Declaration' formulating guidelines for women’s empowerment; based on ideas, issues, and problems discussed at the National Women’s Parliament, held in February this year. Earlier this year on women’s day the CM had said “I will be the first one to support reservations for women in Parliament.” The Amaravati declaration aims at the development of women in education, legal rights, health and nutrition, entrepreneurship, research and innovation, politics, social protection, sustainable development goals, social development and digital literacy. Veda AgriProjects Pvt. 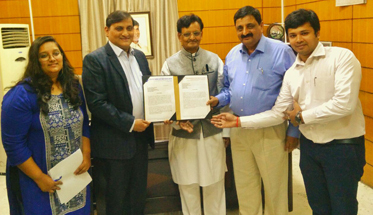 Ltd. (Veda) signed a Letter of Intent with the Andhra Pradesh Economic Development Board to involve in the activities of agriculture and animal husbandry sectors in Andhra Pradesh. A commitment has been made in terms of investment, technology, planning & design, and equipment into setting up a horticulture farming project in the state. Veda wishes to bring in a proposed investment of INR 600 crores generating 600 direct jobs and 1400 indirect jobs. Hon'ble Chief Minister of Andhra Pradesh Nara Chandrababu Naidu encourages cold chain promotion in agriculture, with the intent of more women entrepreneurs in the state. Ensuring that women are informed about the countless opportunities entrepreneurship has to offer. The Chief Minister said that Andhra Bank would be giving out loans of 25 Lakhs for each group according to the Women Entrepreneurship scheme. About 37 South Korean companies have proposed to invest approximately Rs 4000 crores, largely in the automobile sector. The investment by the South Korean companies will see approximately 7,000 new jobs being created within the state. 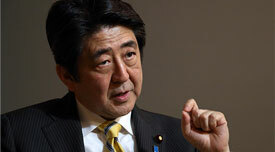 The Chief Minister said that APEDB shall coordinate the project to take it ahead. Andhra Pradesh Economic Development Board CEO Mr. J. Krishna Kishore participated in this meeting. 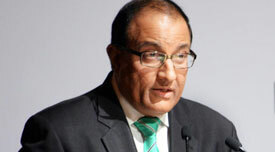 The Chief Minister met with Singapore’s Minister of Trade and Industry S. Iswaran in the Secretariat on Friday. The meeting included discussions regarding Singapore’s involvement in the development of the city of Amaravati, solid waste management projects, district cooling systems and skill development programmes. In this second meeting of the Joint Implementation Steering Committee, the Chief Minister said that the relationship between Andhra Pradesh and the Singapore government has largely contributed to the planning of the capital city, and he was grateful for the continuous cooperation from their side. A global agricultural and food company, Phoenix Group headquartered in Dubai, plans to set up a rice mill with an investment of $50 million (Rs. 325 crores) to process 250,000 of non-basmati rice per annum at Kakinada in Andhra Pradesh. 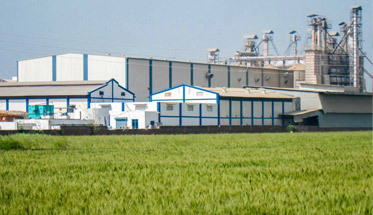 Gaurav Dhawan, Chairman, Phoenix Group, told Business Line that the company has already identified the land required for setting up the rice mill and is in talks with the State government for completing the formality. 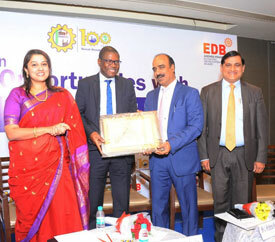 APEDB signs letter of intent for a container freight station and logistics park in Andhra Pradesh. NDR Infrastructure Private Limited and APEDB CEO Mr. J Krishna Kishore yesterday, signed the LoI for a container freight station at Vishakhapatnam. The proposed investment was for 100 crore in two phases with 70 direct and 200 indirect jobs overtime. An LoI was also signed between APEDB and Simhapuri Farmers Agri Parks Private Limited, for an Integrated Logistics Park in Donakonda Mandal, Prakasam District. 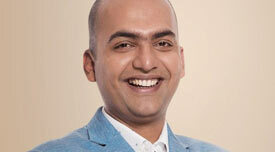 The investor proposed 400 crore in investment with 250 direct and 500 indirect jobs. Mr. J. Krishna Kishore CEO Andhra Pradesh Economic Development Board (APEDB) is attending the World Food India 2017 from November 3-5 in Delhi along with the Chief Minister of Andhra Pradesh Nara Chandrababu Naidu and other ministers from the state of Andhra Pradesh and representation from across India. Andhra Pradesh, ranked 1 st in Ease of Doing Business by the World Bank, provides a conducive environment for businesses to operate and prosper. Andhra Pradesh is determined on creating a world class infrastructure, providing excellent connectivity, and augmenting state’s power generation capacity. The vision of Andhra Pradesh for growth is pivoted on 3 pillars of 7 missions, 5 grids, and 5 campaigns. 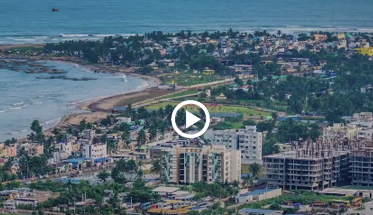 This ‘futuristic’ greenfield city is bound to put Andhra Pradesh in the league of developed states and brings enormous investment opportunities to the world. 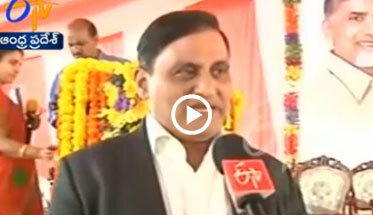 Sets up largest beverage plant in the country. We are very thankful to Andhra Pradesh Government who has been very supportive of our Make in India plans in Sri City, Andhra Pradesh. "I can say for sure the future of AP is going to be great with the kind of plans, resources and leadership it has". 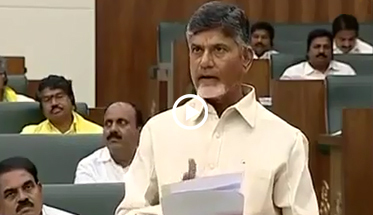 Stay updated on all the latest developments in the Sunrise state of Andhra Pradesh. Urja Global Limited to invest Rs. 200 Crore in Andhra Pradesh to set up an Integrated Electric Vehicle and Lithium-Ion Battery Manufacturing plant. 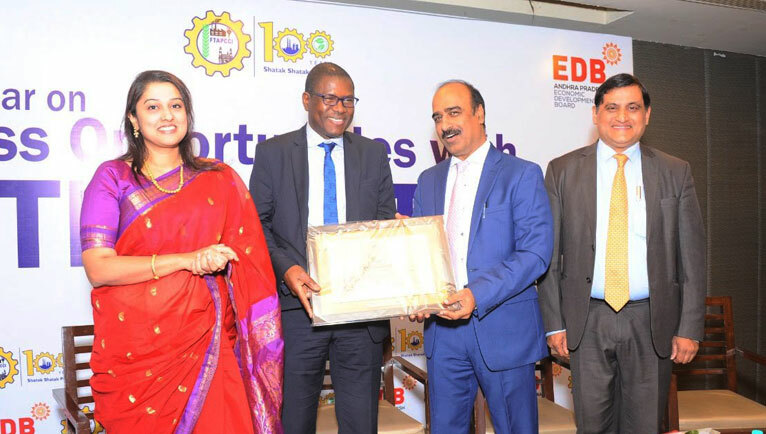 Andhra Pradesh Economic Development Board (APEDB) and Urja Global today signed a Memorandum of Understanding (MoU) for setting up a new plant for manufacturing high technology Lithium-Ion Batteries and electric vehicles for the electric mobility ecosystem. The UN Secretariat Procurement Division (UN Secretariat) conducted a seminar to provide attendants with valuable information on the goods and services required by the UN to execute its mandates, explain the vendor registration process and how to stay abreast of, and participate in, upcoming business opportunities, and to expand the UN’s supplier roster with new companies interested in supplying to the UN. Gold Plus Industries Pvt Ltd today signed an Memorandum of Understanding (MoU) with the Andhra Pradesh Economic Development Board (APEDB). 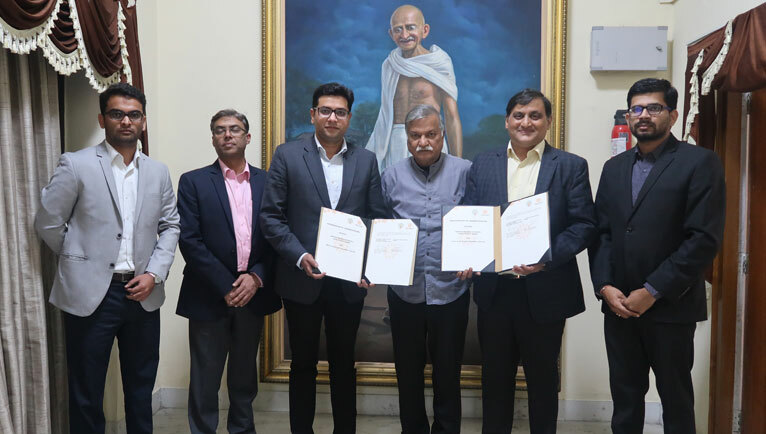 With this MoU, Gold Plus Industries Pvt Ltd intends to put up two float glass manufacturing lines in Visakhapatnam, with an investment of approx INR 2200 crores having installed production capacity of 730000 metric tonnes a year. 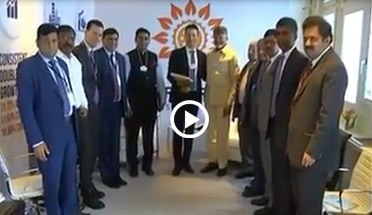 JSW Group today signed an Memorandum of Understanding (MoU) with the Andhra Pradesh Economic Development Board (APEDB) at the World Economic Forum, Davos. Get in touch with our offices or leave us a message. Please contact experts from various sectors. The Government of Andhra Pradesh, in association with the Confederation of Indian Industries and the Department of Industrial Policy and Promotion, Ministry of Commerce & Industry is hosting the 24th Partnership Summit, 2018 from February 24-26, 2018 at Vishakapatnam, Andhra Pradesh. In this context, investment proposals are hereby invited from any entity or person desirous of investing in the State of Andhra Pradesh.